PHOTO BY ERIKA PLATT-HANDRU Ashley Cunningham tops off her frozen yogurt at FroZone, 114 S. Washington St.
FroZone, a self-serve frozen yogurt shop, has opened in downtown Tiffin. Nadine Felton, who owns the shop with her husband, Mitch, and two daughters, Toria and Ari, said the shop opened last week. So far, business has been steady, she said. “I think everybody likes it,” Nadine said. 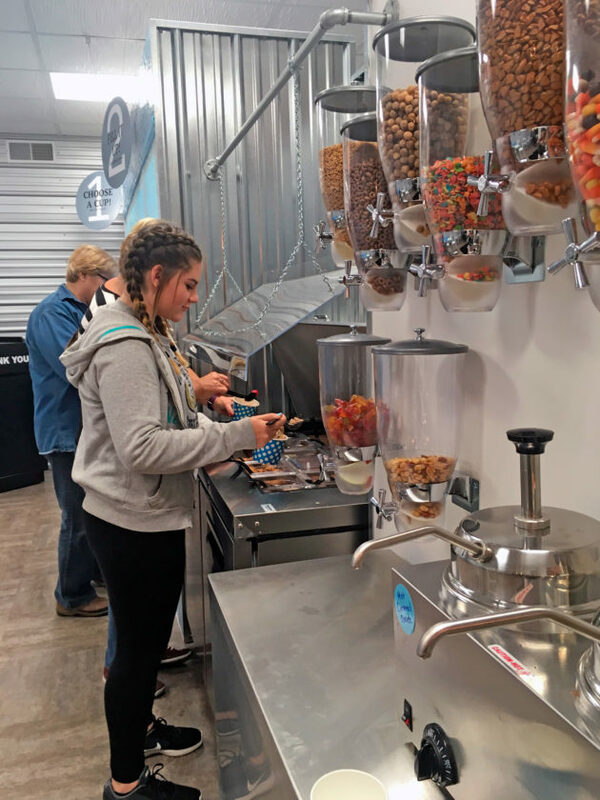 Nadine said the shop, located in the Laird Arcade, offers 12 flavors of frozen yogurt, including some with no added sugar. Nadine said frozen yogurt is available in two sizes, and is sold by weight. Customers can top off the yogurt with a variety of cold and hot toppings, she said. Toppings include candy, fruit, granola, nuts, hot caramel and hot chocolate. Nadine said FroZone’s spoons are unique and make the difference. “You have to come and see,” she said. Nadine said FroZone is open 11 a.m.-9 p.m. Monday through Friday, 4-11 p.m. Saturdays and 5 p.m.-9 p.m. Sundays. Thanksgiving and holiday hours may be different, but are to be posted, she said. A ribbon-cutting is planned for 4:30 p.m. Thursday.